Is It Right If I Add Accessories To My Ice Auger? A manual auger requires one to have physical strength. A manual auger is useful especially when you decide to go fishing in a remote region because it requires no source of energy. Also, when you are fishing at a time when the ice layer is not so thick, a manual ice auger would be ideal since you will not use lots of energy at such a time. To get an ice auger at a fair or cheap price, choose a manual one. An electric auger would go for about three times the price of a manual ice auger. Its price is quite pocket-friendly. Anglers who go ice fishing once in a very long time would rather have the manual auger instead of spending too much on an electric auger yet they go fishing probably once during winter. This one is expensive but has quite some advantages. 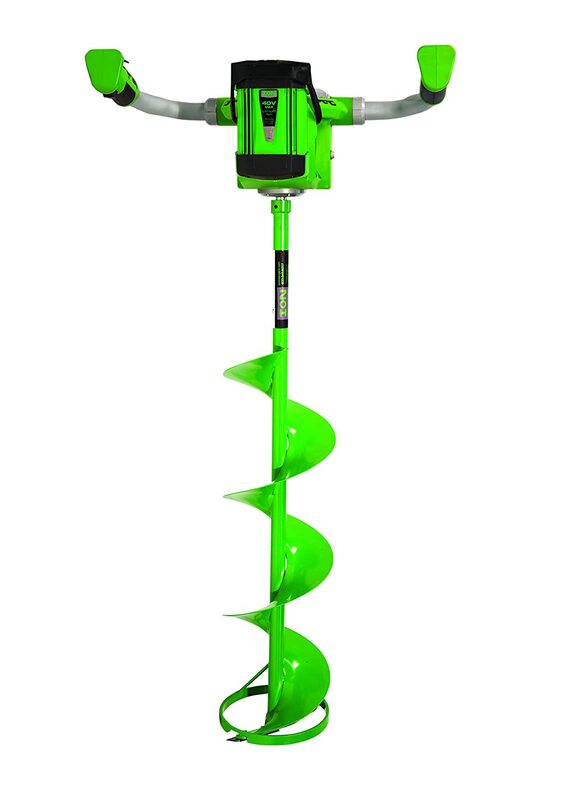 The electric auger produces no noise, and since it is electrically powered, it requires no energy input from the user. It is environmentally friendly because it produces no noise and also because it does not produce oil fumes. Its only downside is that once the battery level gets low, it ceases to perform adequately. 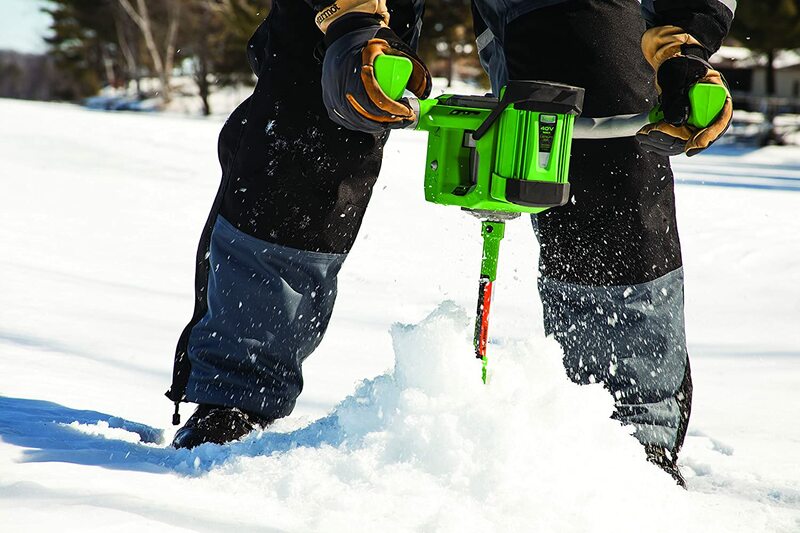 This gas auger provides the fastest way when drilling through the ice. Despite the fact that it is heavy, it is quite reliable, and you can always have a manual auger as back up. It pollutes the environment though due to the exhaust gases that it produces. If you will be going to fish in remote regions, a manual auger is the best. Once the battery level of an electric auger gets low it ceases to be reliable. The blade sizes depends on the size of the fish you are targeting. The sizes range from six to ten inches. The ten inches one is better since it is ideal for fish of larger species and can dig a large hole, almost fifty percent larger than one dug with an eight-inch auger. To achieve maximum results from the auger, always ensure that is has a very sharp blade so that it can drill through the ice fast and with enough ease. How often you change your blade depends on the number of holes you drill. Sharpening jigs are available for you to sharpen your blades. Changing them is also easy enough. 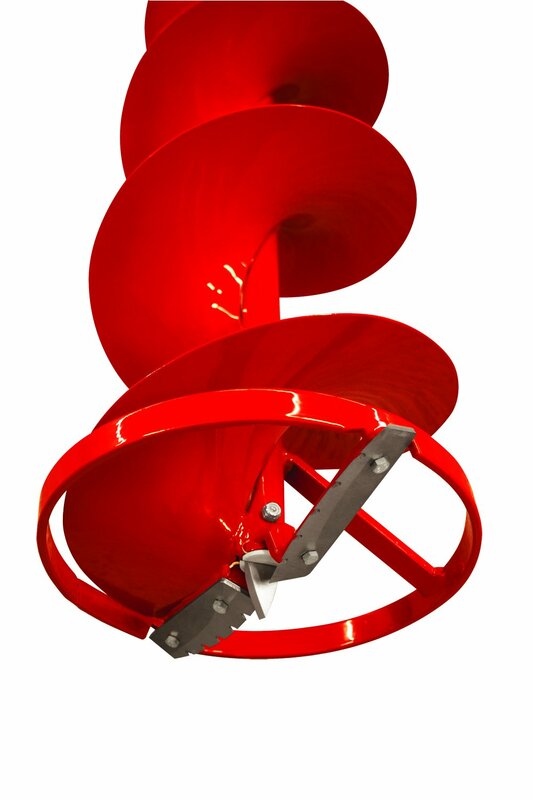 If need be, you can add accessories to your ice auger to make it suit your needs. 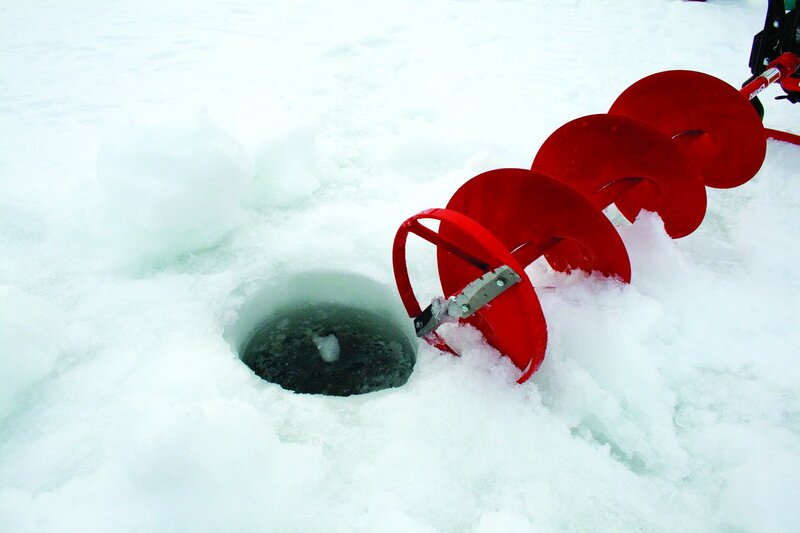 For instance, you can get an extension to ensure that even when you go to areas where the ice is very thick, you can always add your extension so that the auger can drill through the hole well enough to the water level. Having a cover for the head of your electric auger is advisable. This will prevent the plastic components of the auger from getting brittle, and also prevents the exhaust. ION 40V 3 amp-hour Electric 8-Inch Ice Auger, with Reverse​. Eskimo Mako 43cc Quantum Ice Auger. Eskimo High Compression 40cc Propane with 8-Inch Quantum Ice Auger. Strikemaster Ice Fishing Mora Hand Auger. StrikeMaster Chipper Lite Power Auger, Red/Black, 8.25-Inch. Strike Master Ice Augers Lazer Hand Auger. This is quite portable due to its light weight, weighing roughly twenty pounds. For easier operation, it has wide-spaced handlebar. It is 34 inches in length and has a 12-inch extension which serves in areas where the ice is thicker. To be comfortable when using it, it has a trigger button. The ION 40V Ice Auger is made of durable steel and has an 8-inch blade which enables it to drill holes which are large enough for many types of fish. To increase its efficiency, it has a battery charger. It is fast, reliable and powerful. It can drill two holes of 40 feet without changing the blade. It turns out to be one of the best-performing electric augers available on the market. This ice auger is of a high-performance Viper engine with a drilling force of 8,000 RPMs which provides 43ccs of power and is capable of penetrating into very thick layers of ice. Comfort when using the Eskimo Quantum 43cc Ice Fishing Power Auger is enhanced by handlebars which have foam grips and a throttle which you can easily control with your finger tip. This fish auger is available in blades of two sizes, that is the 8 and 10 inches blades. It has a length of 42 inches which can penetrate into thick ice. It comes with two replaceable Quantum blades which ensure that you will have no problems at any one time when drilling through the ice. To start it, an inbuilt primer button is provided. Its fueling cannot be a problem since the gas tank is transparent and so you can clearly see when the level gets too low. Its effectiveness is not affected by cold weather. It is appealing due to its portability and power. The high compression ratio makes it well suited to drill very fast through the ice. It has an auto-prime fuel system which has a switch to start the drilling automatically. The price of the Eskimo 40 cc High Compression Propane Ice Auger is pocket-friendly especially for anglers who frequently go ice fishing. It is perfect for indoor drilling since it produces no gas fumes. You need to adjust the cutters. 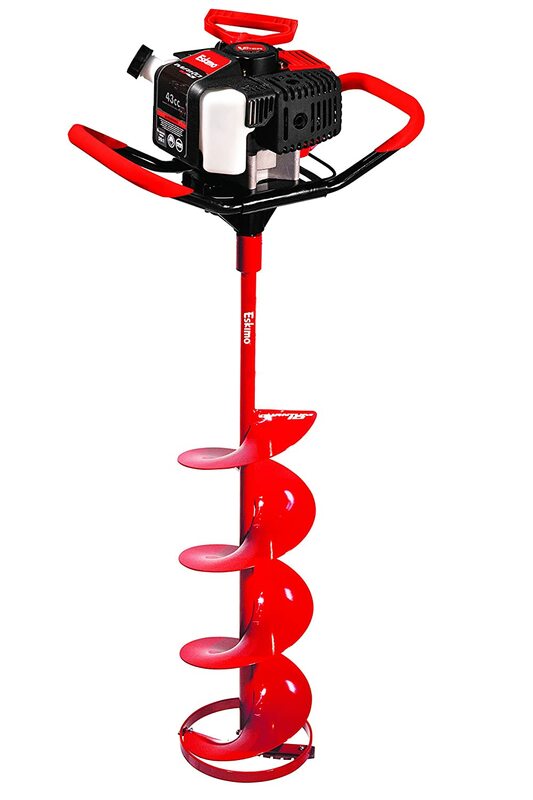 The StrikeMaster Hand Auger has a total weight of 6 pounds which makes it quite portable even over long distances. It is fitted with very soft grips made of rubber to increase comfort. The handle can be adjusted so as to suit taller users such that the handlebar can be adjusted to 57 inches from 48 inches. To reduce ice buildup, the high-alloy carbon steel blades is made with powder coated paint. All features are meant to make your work easier and to increase comfort and control. Its blades are always sharp. Its handle is not sturdy therefore it performs poorly on very thick ice. It is equipped with American Made Transmission for reliable performance, and the gears in the transmission have been treated with heat and are made of steel. The auger is equipped with a steel blade, polymer gear castings and has a lightweight package which offers plenty of power. Its very appealing features are the Vandar long filament and high-impact handles which give it its light weight. Actually, it is the lightest compared to other competing models. It is ideal for drilling new holes as well as re-opening holes that had been drilled. It does not jump around inside the hole that you are drilling due to its pointed chipper blade. Depending on your needs, you can select this auger which has four blades of varying sizes and select the one which is best for the type of fish you are targeting at a time. It has a handle which can be adjusted to 57 inches from 48 inches to suit taller anglers. To enhance comfort, the strike master hand auger has soft grips made using rubber. After so much use the blades get quite blunt. To all anglers, I declare the Strike Master Ice Augers Lazer Hand Auger is the best ice auger. Its model is best suited to ease your work and keep you from straining too much when drilling ice. It is a manual ice auger. Its handle can be altered to suit the user, despite his or her height. The Strike Master Ice Auger comes with four blades of varying sizes, and so you can choose the one that suits your needs according to the type of fish you are targeting. The handle has rubber grips which guarantee comfort. Its additional features are that it has a chrome alloy for efficient drilling, a stainless steel blade, as well as a paint coated with powder needed in the reduction of ice accumulation. Having read this article, I know you can now select the best ice auger that serves you better according to your needs. Getting the auger with the best blade size, suitable weight and one which you can sharpen or change the blade often is ideal. Beside ice auger , you can choose electric ice auger, this is list best electric ice auger , you can refer ! Thank you for reading. Share this article with other anglers who love ice fishing and also feel free to leave any comments on anything you find to be crucial. 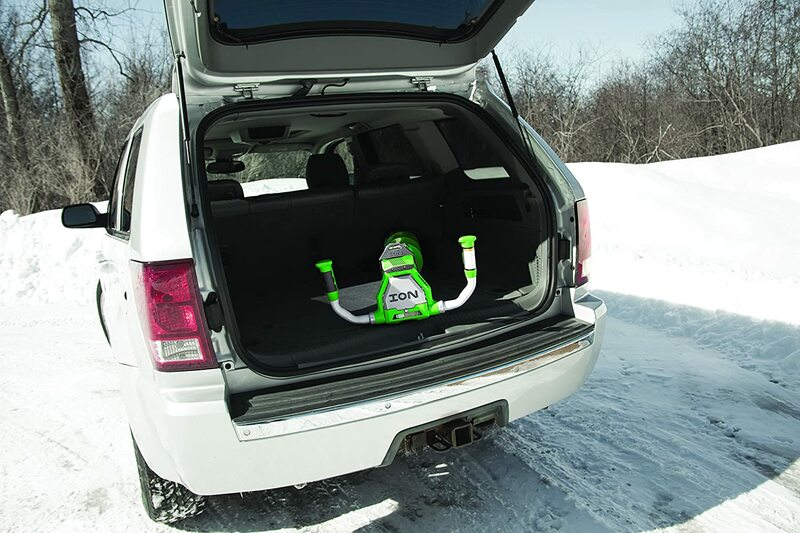 Enjoy ice fishing in the future.